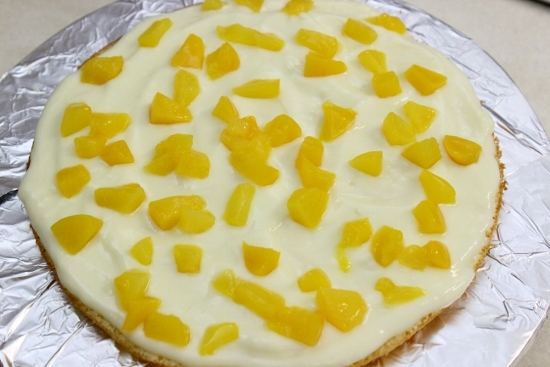 I’ve updated the recipe for this well loved cake since first posting it on July 9, 2012. It’s just as delicious and hopefully easier to follow and make. This week we had a small party to celebrate my sister, Milana’s, engagement and as it turns out, my future brother-in-law loves the flavor of rum in desserts. Score! I didn’t even know that when I was making this cake! Isn’t it great when you make such a great guess? Welcome to the family, Andrey! We are so happy for the two of you. We also had Raspberry “Piece of Cake” Cake, and when we took a vote, the table was split down the middle. It’ll be up to you to decide. I couldn’t agree with him more. 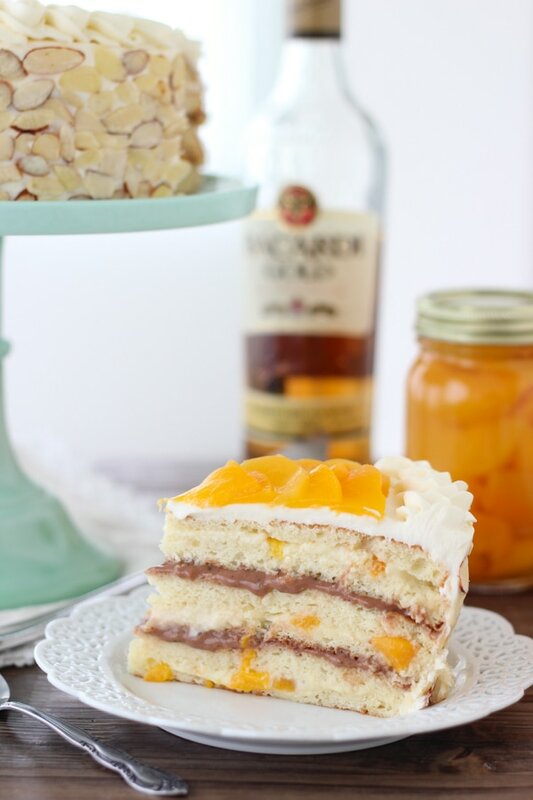 This cake is incredibly moist and flavorful, and with the addition of a rum syrup soaked into the light and fluffy sponge cake layers, it also has peaches, and all comes together in a feather-light cake packed with summery flavors. (My own wedding cake was a cannoli cake with peaches:), so of course I had to add those in too). With layers of vanilla and chocolate pastry cream in between the cake, it’s also topped with a cream cheese frosting. I also think that it just wouldn’t be the same without toasted almonds. It gives the cake a crunchy texture and adds to the combination of all the other flavors. Make your sponge cake layers first. 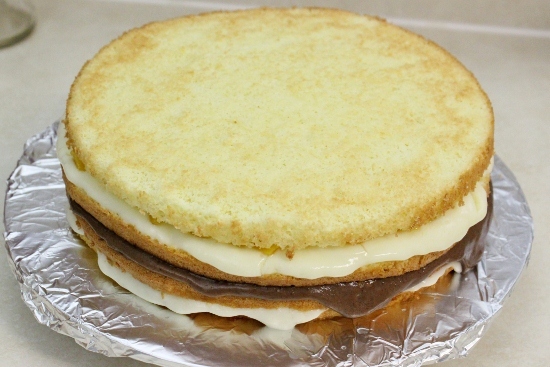 Since you will need 3 cake layers, make 1 1/2 of the Sponge Cake recipe. For the step by step instructions on how to make and bake the sponge cakes, click HERE. 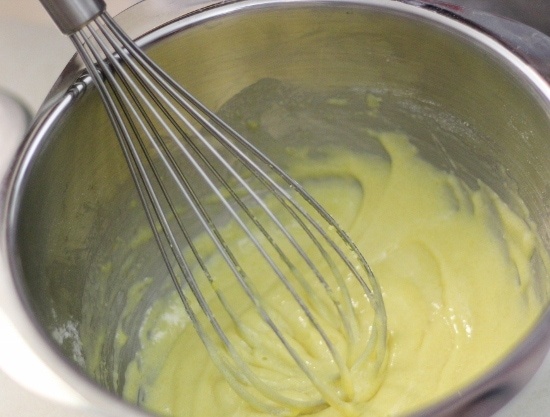 Whisk the egg yolks, sugar and flour until they are an even consistency. It will be pretty stiff, so don’t panic and think you did something wrong. Scald the milk, heating it just before it boils. 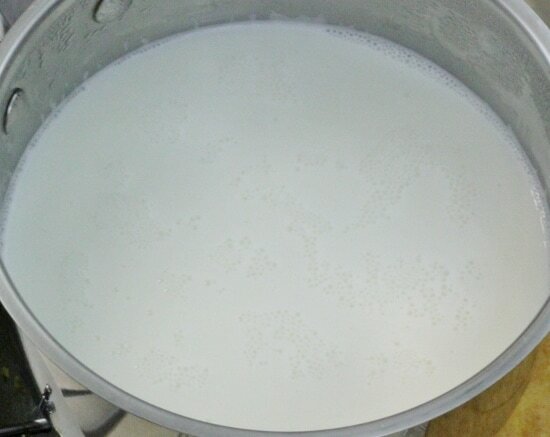 You will see tiny little bubbles on the surface of the milk. This picture isn’t that great, but you get the idea. Slowly pour in a little bit of the hot milk into the yolk mixture, whisking vigorously as you pour, to loosen it up a little. 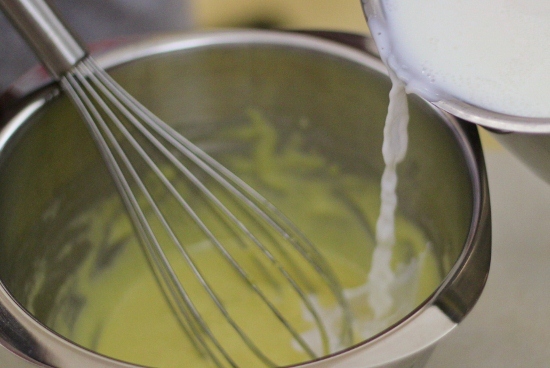 Continue adding the hot milk to the yolk mixture, whisking the whole time. This will prevent the egg from curdling and also from having lumps in the pastry cream. Add the rest of the milk. 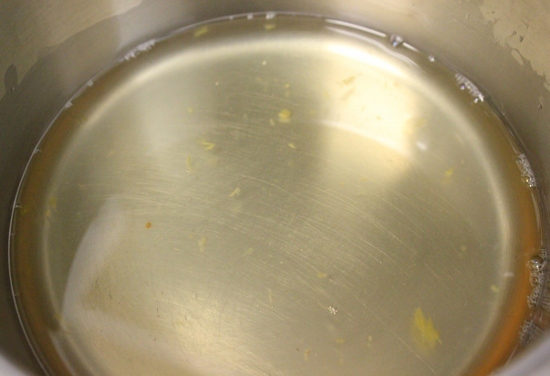 Pour the whole mixture back in the pot and heat over medium low heat, stirring frequently until it thickens. Add the butter, mixing it in until it melts completely. If you do get lumps, it’s not the end of the world, just pour the pastry cream through a fine-mesh sieve. No problem – no more lumps. Set aside 1 1/2 cups of the pastry cream. Chop the chocolate or grate it on a box grater. Add the chocolate and chocolate liquer to the 1 1/2 cups of pastry cream and mix until the chocolate has melted. Cool both pastry creams. You can cool slightly and place in the refrigerator, or set it in a bowl of ice water to make it faster. Make sure to cover the pastry cream with plastic wrap or parchment paper right on top of the pastry cream to prevent a skin from forming on the surface. Meanwhile, drain the peaches, reserving 1/2 – 3/4 cup of the peach syrup. 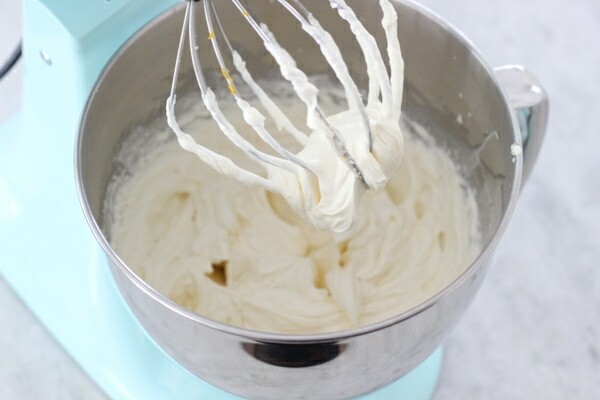 Use a standing mixer with a whisk attachment or a hand mixer to mix the softened cream cheese with the powdered sugar and vanilla until evenly combined, scraping down the sides of the bowl a few times. 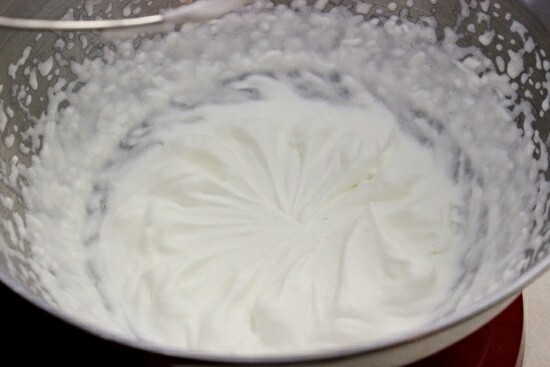 Pour in the heavy cream (make sure it’s really cold) and mix again, starting on low speed (it will spray all over the place if you don’t) and gradually increase to high until the frosting is nice and thick. 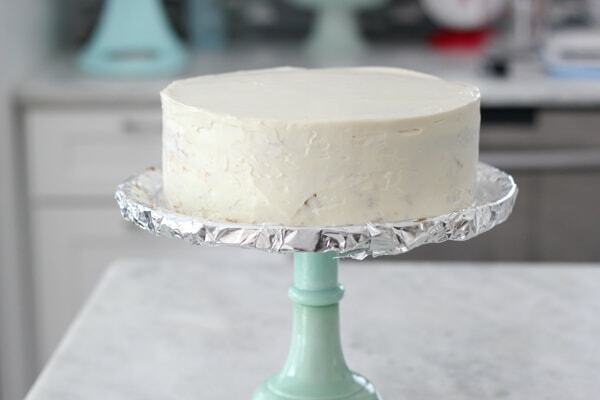 Prepare the cake plate or cake stand by lining all the edges with aluminum foil. (This will make clean-up a breeze later). Cut each sponge cake in half horizontally. The cake layers will be pretty thin once you slice through them, but that’s the cake that we’re going for – really juicy with lots of layers. Brush the top of each layer with the syrup. Top with about 1/3 – 1/2 cup of the vanilla pastry cream. Sprinkle with some of the chopped peaches. Top with another sponge cake layer, brushed with syrup. Spread about half of the chocolate pastry cream on top of the cake layer. 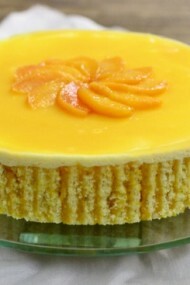 The next layer of cake is spread with more vanilla pastry cream and peaches. Brush the next layer with the syrup, spread with the remaining half of the chocolate custard. 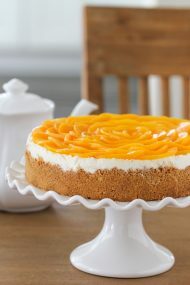 Top with another cake layer, brushed with syrup, spread with vanilla custard and more peaches. Top with the last cake layer. If you have pastry cream oozing out of the sides like I did, take of off with a spoon or spatula:). You might have a bit of the pastry cream left over, that’s fine. A nice little treat for the cook:). Let the cake firm up a bit in the refrigerator, for at least an hour. It will be much easier to spread the frosting over it. I like to leave it in there overnight. Since one of my cake pans was not exactly the same size as the other two, I trimmed the sides of the cake to be even. Also easier to do after an hour or two in the fridge:). 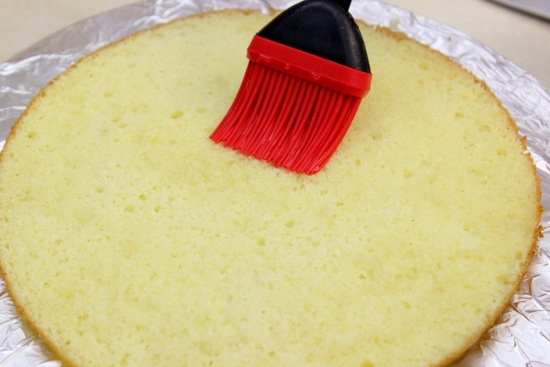 Spread some of the cream cheese frosting on top of the cake and on the sides of the cake. 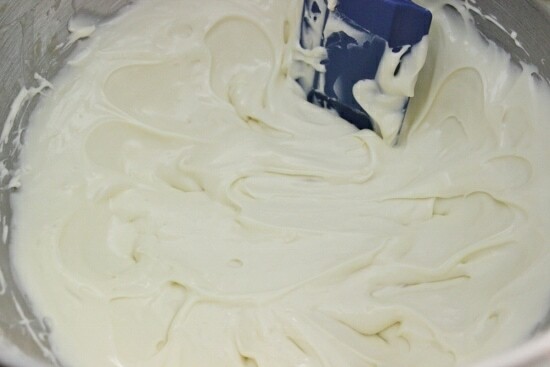 I used a 1 M Wilton frosting tip to pipe more of the cream cheese frosting around the perimeter of the cake. (It’s easier to pipe the frosting if it’s really cold, so I put it in the refrigerator for about 15 minutes first.) Then I shingled the thinly sliced peaches in the center of the cake, so that they were overlapping each other. Store the cake in the refrigerator. Make your sponge cake layers first. 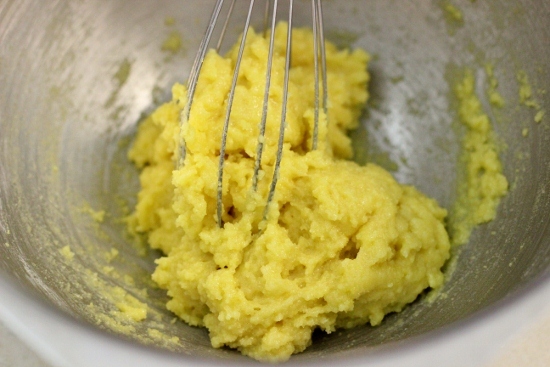 Whisk the egg yolks, sugar and flour until they are an even consistency. It will be pretty stiff, so don't panic and think you did something wrong. Scald the milk, heating it just before it boils. You will see tiny little bubbles on the surface of the milk. Slowly pour in a little bit of the hot milk into the yolk mixture, whisking vigorously as you pour, to loosen it up a little. 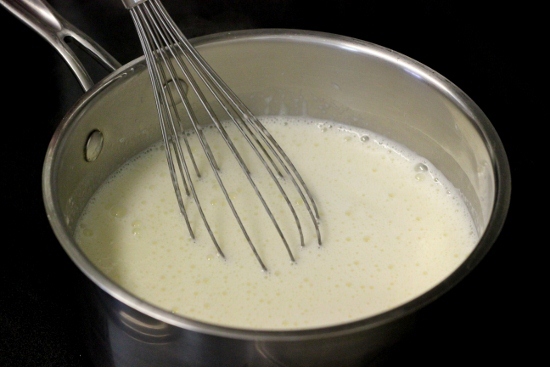 Continue adding the hot milk to the yolk mixture, whisking the whole time. This will prevent the egg from curdling and also from having lumps in the pastry cream. Add the rest of the milk. Pour the whole mixture back in the pot and heat over medium low heat, stirring frequently until it thickens. Add the butter, mixing it in until it melts completely. If you do get lumps, it's not the end of the world, just pour the pastry cream through a fine-mesh sieve. No problem - no more lumps. Set aside 1½ cups of the pastry cream. 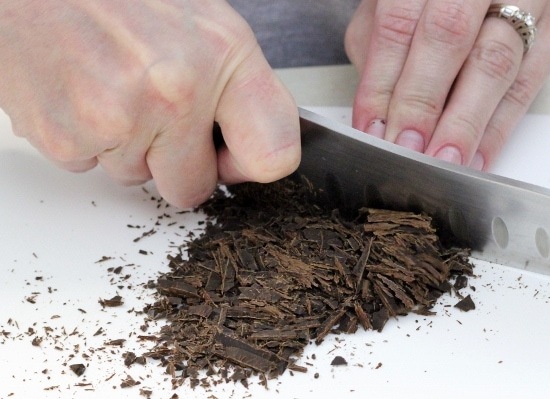 Chop the chocolate or grate it on a box grater. 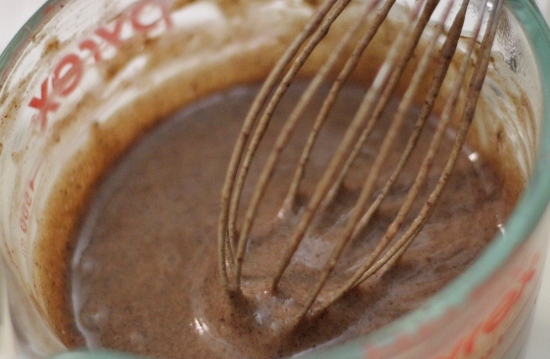 Add the chocolate and chocolate liquer to the 1½ cups of pastry cream and mix until the chocolate has melted. Cool both pastry creams. You can cool slightly and place in the refrigerator, or set it in a bowl of ice water to make it faster. Make sure to cover the pastry cream with plastic wrap or parchment paper right on top of the pastry cream to prevent a skin from forming on the surface. 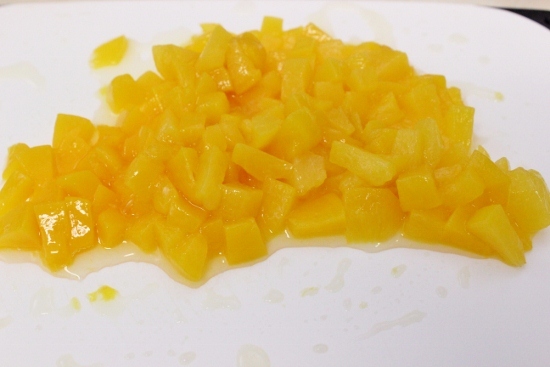 Drain the peaches, reserving ½ - ¾ cup of the peach syrup. Mix the rum and peach syrup together. Chop the peaches from one of the cans into small pieces. Slice the other can of peaches into thin slices. Prepare the cake plate or cake stand by lining all the edges with aluminum foil. (This will make clean-up a breeze later). 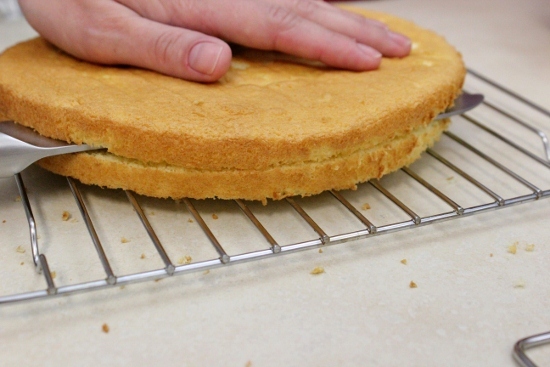 Cut each sponge cake in half horizontally. The cake layers will be pretty thin once you slice through them, but that's the cake that we're going for - really juicy with lots of layers. Brush the top of each layer with the syrup. Top with some of the vanilla pastry cream. Sprinkle with some of the chopped peaches. Top with another sponge cake layer, brushed with syrup. 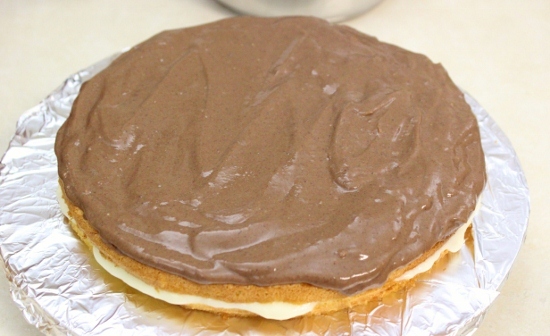 Spread about half of the chocolate pastry cream on top of the cake layer. 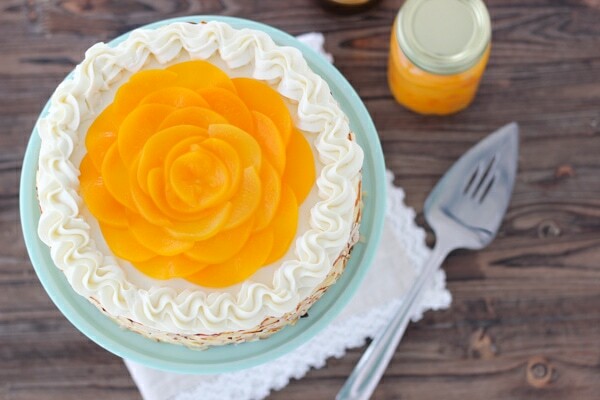 The next layer of cake is spread with more vanilla pastry cream and peaches. Brush the next layer with the syrup, spread with the remaining half of the chocolate custard. 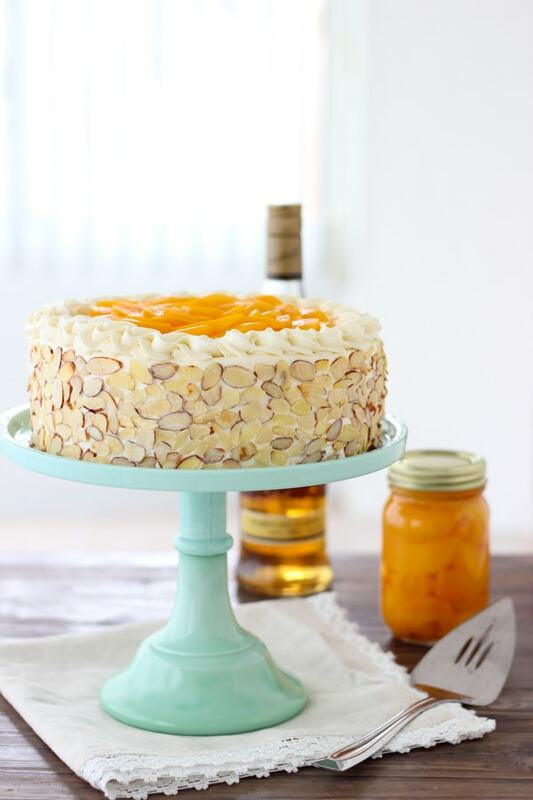 Top with another cake layer, brushed with syrup, spread with vanilla custard and more peaches. Top with the last cake layer. 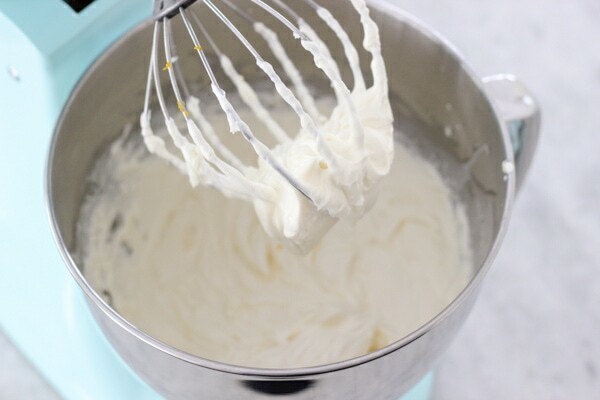 Pour in the heavy cream (make sure it's really cold) and mix again, starting on low speed (it will spray all over the place if you don't) and gradually increase to high until the frosting is nice and thick. 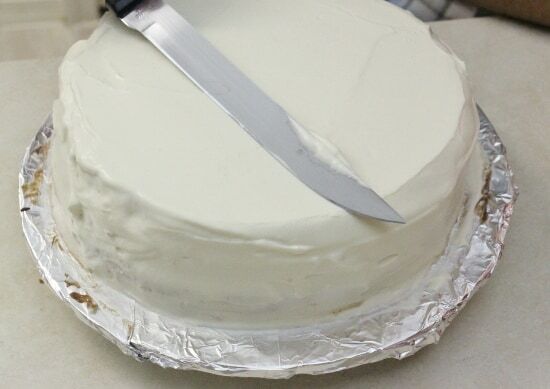 I used a 1 M Wilton frosting tip to pipe more of the cream cheese frosting around the perimeter of the cake. (It's easier to pipe the frosting if it's really cold, so I put it in the refrigerator for about 15 minutes first.) Then I shingled the thinly sliced peaches in the center of the cake, so that they were overlapping each other. This cake looks amazing. Thank you so much for all the amazing recipes. Every single recipe we tried so far is absolutely delicious. I’m so glad to hear that the recipe turned out well for you too. It’s one thing to make the recipe myself, but it’s very reassuring when it works in other kitchens and for other cooks too:). Ruuuuum rum rum rum! 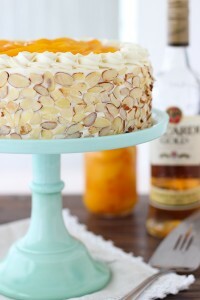 This cake was one of the best rum cakes I have ever tried! Thanks for the experience! i love coming over to your place every time! We love having you too:). I’m glad I made such a great guess and made a cake just for your tastebuds. It was a lot of fun. I am so glad we will be spending more time together in the future and share some awesome memories! Thanks for being part of our mutual celebration. Thank you Lea! I am so honored. This cake looks so fluffy & delicous! Thanks for the step-by-step photos…they are super helpful! You’re welcome, olviya! I always thought that step-by-step photos are so helpful for me. I like seeing the process:). I want to make this cake this weekend and I don’t have the rum. I want to go buy it but I don’t know what brand to buy best. Which one would you recommend? Natasha, I usually buy Bacardi Gold, because that is what they have at the store. There might be something better, but that’s the only one I used. Olga, i am planning to make this cake this weekend, but i have ?. 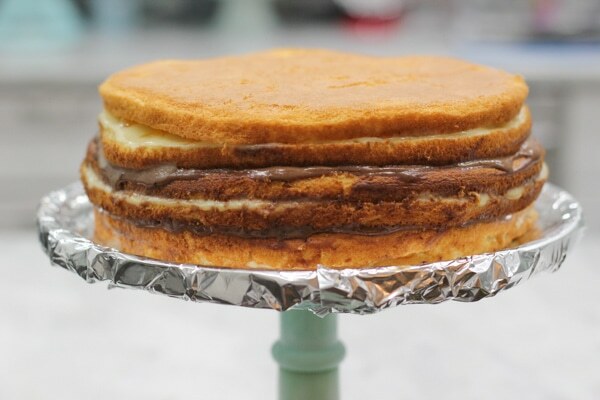 It calls for two sponge cakes, so do you use 10 eggs, or 5 eggs and divide the batter in half? 5 eggs seem like too little for two sponge cakes, and your layers look pretty tall here..
You will get 2 cake layers from one batch, so only 5 eggs total. The cake is a typical round cake size of 8 inches. If you’re making the cake for a big group, I would probably make two cakes. One cake is enough for a small group. Our family likes this cake for parties too. My sister and I make it quite often. Glad you liked it too. olichka,thank you for the recepy….looks so good,what kind of cake flour did you use? Olya, I might have missed it, but I didn’t see in which step was vanilla added. Would you mind clarifying that for me please? For the pastry cream that is. 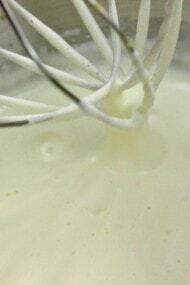 Add the vanilla right after you cook the pastry cream. You can add it at any time after that, really. It doesn’t really matter at that point. 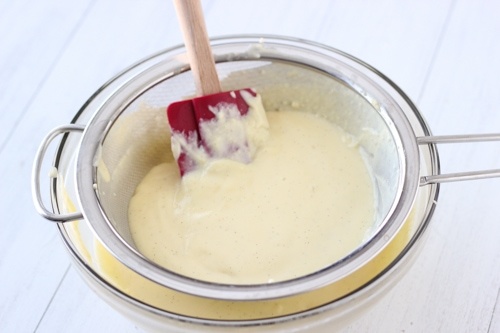 The main thing is not to add it when cooking the pastry cream, or the vanilla flavor will cook out. In the recipe instructions, I wrote to add it in with the cream cheese, but it really doesn’t matter. Hi Olga! This was my first recipe I made from your blog. Everything was perfect and good, but my pastry cream was kinda runny, did i have to cook it longer or what? Thanks for your wonderful recipies and easy to follow instructions! Most likely that’s what you needed to do. The longer you cook it, the thicker it will be. This cake was so good! My pastry cream was runny as well, next time I will cook it longer. But overall the taste was great, I like that its not too sweet, it was just perfect for my taste buds. Will definitely make again. Thank You. I don’t like when desserts are too sweet. That’s one of my favorite aspects of this cake, Irina. Thanks for taking the time to let me know. can you please add the printing option to this recipe like you have on your all other recipes? the pastry cream consistency worries me a bit. Yours look runny . Does it need to be so runny or will set in the fridge? 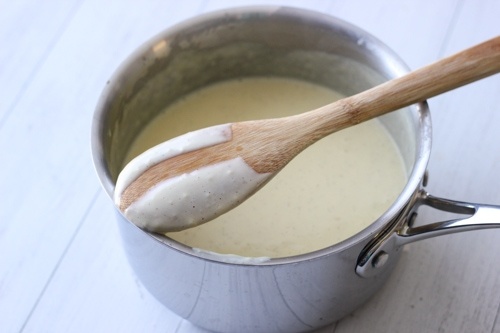 The pastry cream does thicken in the refrigerator. If it’s too runny, you need to cook it longer. Hope that helps, Kam. …Also Olga please tell me cream cheese in frosting you will need 2oz or 4oz? Not sure how to understand that? sorry but I live in UK and not sure if your packaging for cream cheese is 4oz or this 4oz is already half? One package of cream cheese is 8 oz. Half of a package is 4 oz. You will need 4 oz for this recipe, which is half of a package here in the US. What temperature do you bake the cake layers at? 350 degrees Fahrenheit. You probably didn’t get a chance to look at the cake recipe, but it’s written in the instructions. Olga, beautiful recreation of this cake! One quick question: Are you still using a 9 inch pan here? I know your sponge cake instructions indicate that, but it just looks a bit wider and not as tall in these pictures, but it may just be the picture. Please let me know. Thanks! Yes, I still use a 9 inch cake pan, Tania. Thank you so much, Tanya. You’re absolutely right, presentation is really important, which is why I’ve been working furiously to improve my photography skills through the years:). Hi Olga. Love your recipes!! How far in advance can I make this cake? 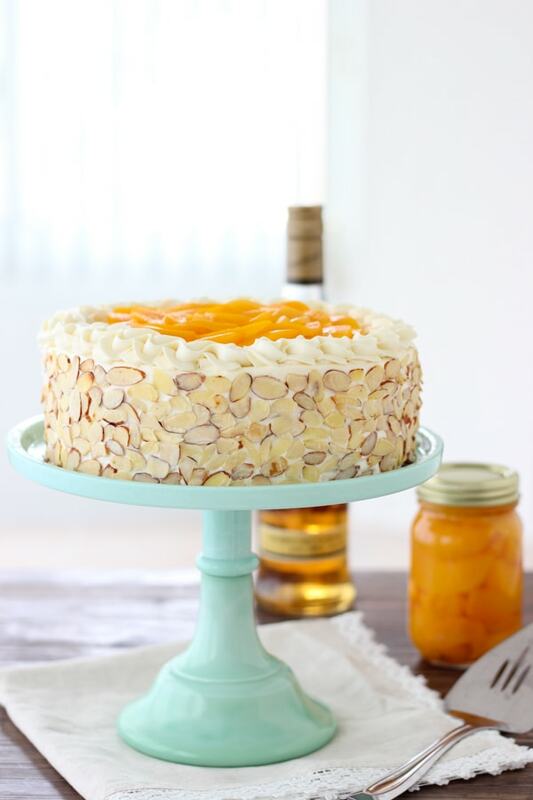 Can I make this cake on Friday afternoon, fully assembled and decorated with peaches, to be served Saturday evening? Thank you!